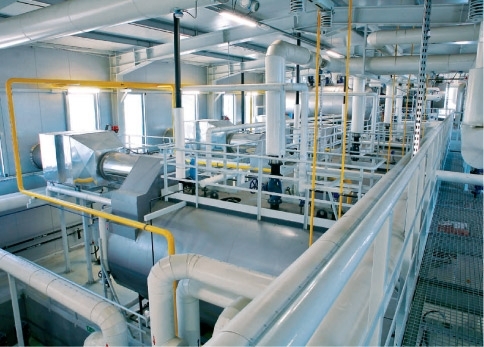 The gas fired condensation heat and power plant for SOKOŁÓW S.A., commissioned in 2016 and operating in the high-efficiency cogeneration technology, is one of the most ecological and technologically advances power generating facilities for the food processing industry in Europe. The heat and power plant is generating electricity, saturated water vapour and hot water for production needs of the plant. The boiler part comprises three Viessmann steam boilers type Vitomax 200 each with a capacity of 7 t/h. 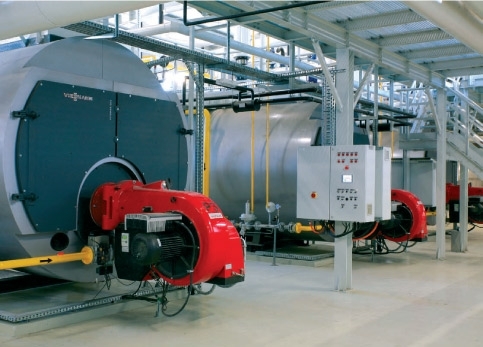 The boilers are furnished with Weishaupt gas burners and Gestra boiler automatic control engineering. Both the cogeneration units, and the boilers are operating in the vapour condensation technology. Flue gas temperature in the chimney is below 70°C. The main headquarters of the plant is in Sokołów Podlaski. Manufacturing plants are in Sokołów Podlaski, Koło, Robaków, Dębica, Czyżewo, Jarosław and Tarnów. The company also has an office in Warsaw. For years the SOKOŁÓW S.A. group has been a precursor of changes and sets out new standards in the meat processing industry. Only top quality raw materials are used for production, the major part of which is obtained under cooperation programmes with breeders. Production is taking place in accordance with requirements of recognised international IFS and BRC standards. All plants have been issued with the ISO14001 certificate, conforming the meeting of top environment related requirements. SOKOŁÓW S.A. has been occupying top positions in rankings for years now. According to the Ranking of Polish Brands of the Rzeczpospolita daily, the Sokołów brand is the most valuable and strongest Polish brand in the meat processing sector. Brands manufactured in the SOKOŁÓW Group have been awarded among others by the following awards: “Ulubiona Marka”, Godło “Teraz Polska”, “Nagroda Kupców Polskich”, “Złoty Paragon” and “Przeboje FMCG”. The company has also been distinguished in the European Trusted Brands survey (Superbrands 2013, 2014, 2015/2016). The most recent brands, “Naturrino” and “Uczta qulinarna”, have been distinguished by Gold Medals during the International Poznań Fair.